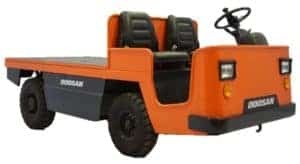 The Doosan BUV Personnel Carrier will move people or cargo quickly and safely. You’ll be able to save time and money by swiftly transporting people and cargo. 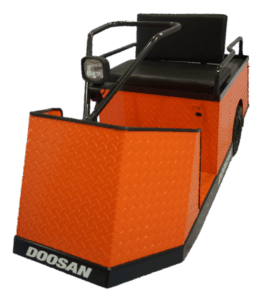 Doosan’s BSC Stock Chaser brings an easy alternative to costly full size order pickers, all with Doosan’s reputation for reliability built-in at no extra charge. Doosan’s Model BBC 23 & 28 Burden Carriers are designed to move people and heavy loads efficiently and safely through manufacturing and warehouse environments. The 48 volt Curtis controller provides the smooth acceleration and maneuverability necessary to deliver its cargo on time. A dual brake system gives you the stopping power required for heavy loads. Standard power steering makes driving effortless and the tilt steering column adjusts to comfortably fit any size operator. 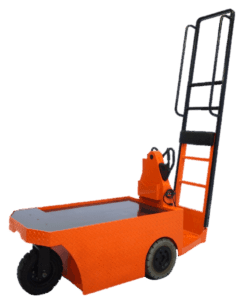 This model is a cost effective solution for any warehouse that needs to move heavy loads without tying up productivity by using another forklift.